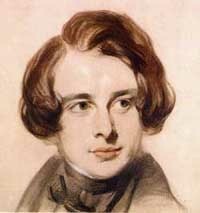 By the summer of 1838, Dickens had already established himself as a popular author with the publication of such novels as the Pickwick Papers, and Oliver Twist. During that summer he stayed in No.4, Ailsa Park Villas. The house which is now No.2 still stands almost opposite St Margaret’s station and close to the Catholic Church. While there, he was visited by friends such as Jerrold, Maclise, Talfourd, and Thackeray. He found Twickenham "a peaceful and rural retreat" where he enjoyed long rides and summer sports: bagatelle, battledore,quoits, bowling and "bar leaping". Dickens's stay in Twickenham was brief, but not his only visit.to the area. For twenty years he came to the Star and Garter Hotel on Richmond Hill with his wife, and friend John Forster to celebrate their wedding and Forster's birthday. While visiting Twickenham later, Dickens may have learnt of the story of Eliza Emily Donnithorne in Australia. Her failed marriage experience has been held to have provided him with inspiration for the character of Miss Havisham in Great Expectations. In June, 1862 he was visiting Sir Richard Owen, the famous naturalist, in Richmond. There he encountered Mountstuart Elphinstone Grant Duff, a later resident of York House, Twickenham. Duff related the encounter in his diary: "I had never seen Dickens before, and thought his looks singularly unprepossessing. The first unfavourable impression, however, very soon wore off, and I did not detect anything in his conversation that at all answered to his appearance..."
The morning scene at the ferry, from Little Dorrit, as drawn by "Phiz"
Dickens used the area to illustrate scenes in a number of his novels. In Nicholas Nickleby (1838-9) the young Miss Morleena Kenwiggs goes to Eel Pie Island for a picnic. The fatal duel between Sir Mulberry Hawk and Lord Verisopht took place in the fields just upstream of Ham House. In Little Doritt (1855-57), Arthur Clennam pays a visit to Mr Meagles at his cottage residence in Twickenham, crossing the Thames on the ferry to Ham and back before breakfast: "... As the morning was fine, and he had an hour on his hands, he crossed the river by the ferry, and strolled along a footpath through some meadows. When he came back to the towing path, he found the ferry-boat on the opposite side, and a gentleman hailing it and waiting to be taken over." Old Betty Higden, in Our Mutual Friend (1864-5) lived in Brentford where she cared for foster children and had a lively dread of the Isleworth Poor House. Hampton Court Maze and Twickenham are mentioned in Sketches by Boz(1836). In Sketches of Young Couples (published anonymously in 1840) a pleasure party goes up by boat to Eel Pie Island. Earlier still, Bill Sikes and Oliver Twist passed through Hampton en route to a burglary in Halliford and they stop to eat at an inn there. Lightwood and Wrayburn in Our Mutual Friend spend a summer vacation in Hampton. Mrs Gowan had a Grace and Favour residence at Hampton Court Palace in Little Dorrit. 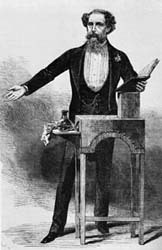 Dickens travelled the country reading to audiences, from his novels. He also arranged for childrens' holidays and parties, where he would perform as a conjurer. His biographer and friend, John Forster, describes the formation of a Balloon Club of which he was the president and Dickens the honorary secretary. There were perhaps no more than two other members. It was the duty of the president to obtain balloons for children going on holiday, a task which he failed to carry out to the satisfaction of the honorary secretary. Learn all about the great man himself online on the BBC website.